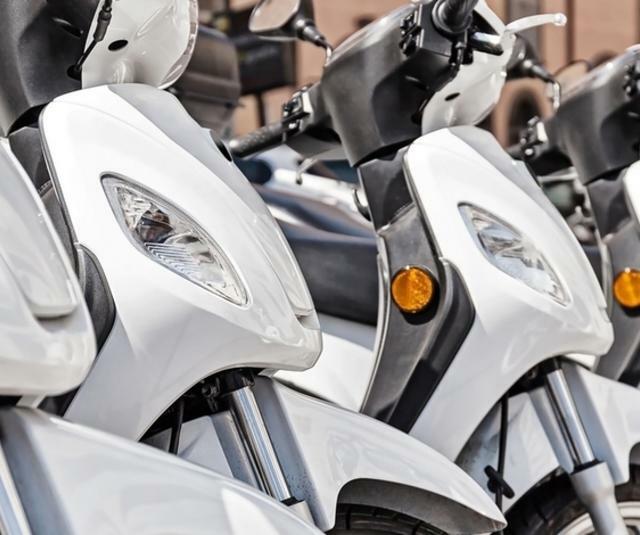 Scooters & motorcycles are using high finishing quality parts with primer, topcoat & clearcoat application. Electrostatic bell application is highly recommended to get the best quality with added cost savings & a high production output. One of the highest quality parts is the oil tank with an exceptional glossy clearcoat and a deep topcoat application. The SAMES KREMLIN electrostatic bell is highly recommended by top manufacturers to reach these requirements. 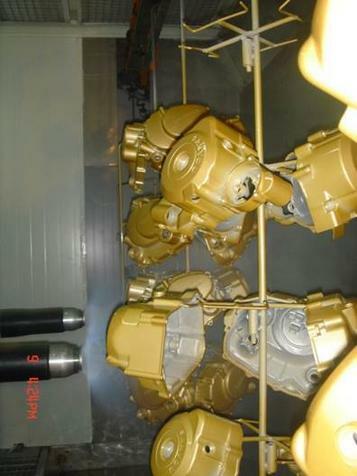 Metallic parts with mechanical functions will also need a high finishing quality (glossy with metallic effects). 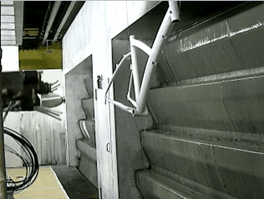 An electrostatic process bell with a gun on the top layer can easily produce the desired effect. 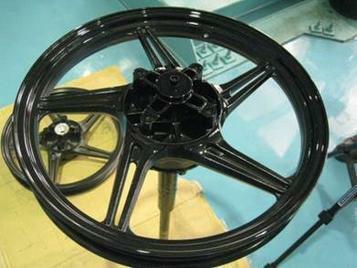 High production output with optimum quality (uniform coverage, glossy metallic, or dark effect) is required for motorcycle wheels. 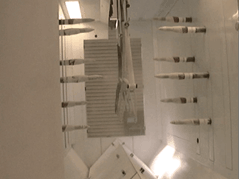 Electrostatic bell application is highly recommended to produce the job, with a gun top layer application if needed, depending on the paint material. 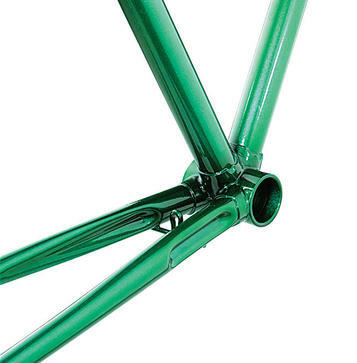 High finishing quality is required for bicycle metallic frames. SAMES KREMLIN electrostatic bell is highly recommended by the top manufacturers to get the best wraparound effect (high transfer efficiency) & high finish quality. 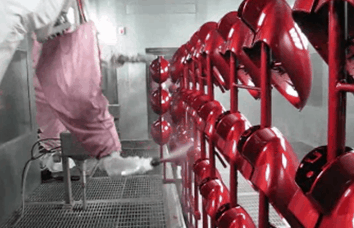 Paint application will be done manually or automatically with a reciprocator. Electrostatic effect will be used with a NANOGUN manual gun or a PPH308 bell. 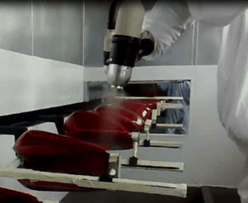 For fully automatic lines, a robot can make sure that all recessed areas are sprayed with paint ensuring manufacturers do not need operators for manual touch-ups to produce the desired quality. 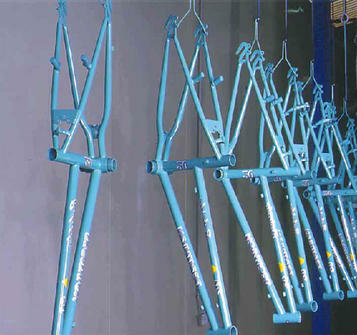 When high thickness, durability & severe working conditions are a concern and high finishing quality is not the priority, powder paint is a must for bicycle frames. SAMES KREMLIN powder equipment can certainly produce the desired finish.